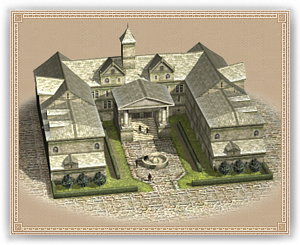 An Academy allows the recruitment of spies, assassins and diplomats from a castle. With the clergy having a rather limited role in castle life, there’s typically too few of them on hand to help in terms of education in such a place. Constructing a small Library behind the castle walls may not turn the place into a great centre of learning, but it will however ensure that the ruling lord can train specialists here such as diplomats and spies, should he so require. A diplomat is a man who serves his people as a representative in negotiations. His well-spoken manner and ability to read those he deals with will come to the fore whether he is being sent to impress, flatter, bribe, threaten or barter with foreign dignitaries and officials. Diplomat 外交官 A diplomat is a man who serves his people as a representative in negotiations. His well-spoken manner and ability to read those he deals with will come to the fore whether he is being sent to impress, flatter, bribe, threaten or barter with foreign dignitaries and officials.